Mary Berry attended the Show, giving two cooking demonstrations along with a book signing in our Food Hall. Mary Berry, besides being known to millions through her recent series, Great British Bake Off on BBC 2 prime time and various other shows, is the writer of more than 50 popular cookbooks, many of which deal with family cookery and some exclusively with cakes and desserts. She often makes guest appearances on Woman’s Hour, had a regular cookery slot on BBC Radio 2’s Debbie Thrower Programme, and she takes part in local radio phone-in programmes. Mary has been cookery editor of Ideal Home and was a member of the Council of Food from Britain. 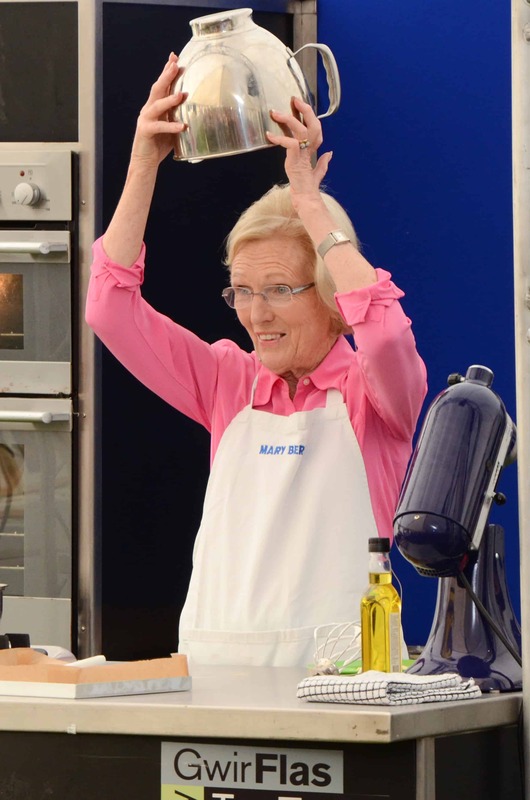 Mary was also a regular contributor to Saturday Cooks (ITV 1) and Christmas Cooks! (ITV1). Mary has also recently appeared on Celebrity Cash in the Attic (BBC 1) and Supersizers Go…1950s broadcast prime-time BBC 2. Sales of Mary’s books have exceeded 4 million. Demonstration and book signing times will be clearly displayed in the Food Hall. With 40 Exhibitors in the Food Hall, offering a fantastic array of high quality local produce, please make sure you visit the Food Hall and enjoy the lively atmosphere! !